I really though I made a total mess from this recipe. The problem was that instead of putting 1000g of flour I measured only 650g without noticing my mistake. As the recipe said, I let it for autolyse for 1 hour. When I came back to add the rest of ingredients I saw that my dough was actually a running composition. I understood my mistake and I have decided to add more flour. But instead of putting the same type of white bread flour I wanted to give a try to an addition of rye flour. This is how actually I made my own recipe and the inspiration from the book is more that I have started from there. 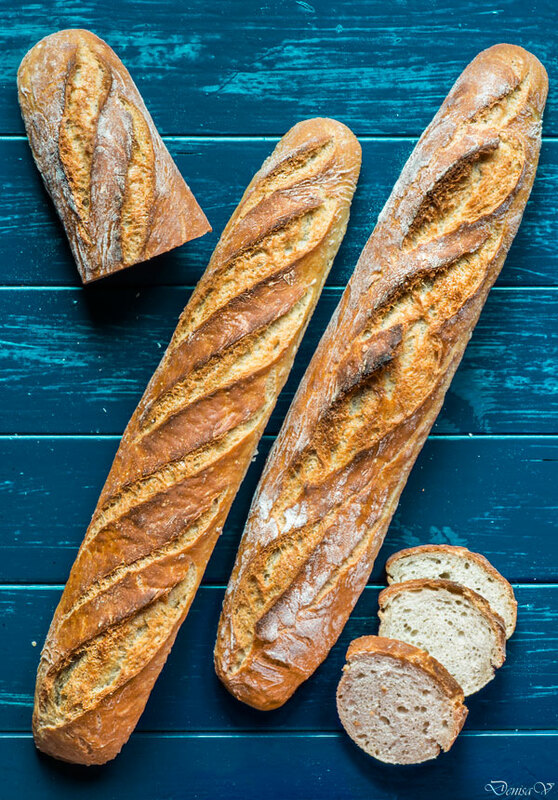 The surprise was that these baguettes turned to be one of the best baguettes I made before. they opened nicely after scoring and they have an amazing taste. Mix water with the 2 flours for 4 minutes on a low speed and let it stay covered for autolyse for 1h. Add sourdough, yeast and salt and mix for 10 minutes on a higher speed. Bulk fermentation 1h30 at room temperature. Shape 3 (or more) baguettes. Final fermentation in baguettes shapes for 1h30 at 24ºC. Bake with steam in the first 15 minutes at 260ºC and continue for another 20 minutes reducing the temperature to 220ºC. This recipe was inspired from Le Larousse du pain - Eric Kayser, page 55.